The term’s meaning depends very much on the context and generally means ownership of an asset. For most people equity is another word for stocks or shares which represent ownership in a company. As a shareholder you own part of the company and thus can influence decision making and share in the profits the company generates via dividend distributions. Out of the three main asset classes – Cash, Fixed Income and Equities, the last is considered most volatile and can display large fluctuations in a short period of time. One of the reasons for this is that equities are considered the least secure of the three. Should a company get into financial difficulties creditors and bond holders are paid first. Any capital left is distributed to shareholders, usually that means nothing. Another factor that impacts the value of equities much more than fixed income is a change in the expected sales and/or profit figures of a company. The market continually ‘prices in’ probabilities of events, hence when there is a surprise the market moves significantly. A negative adjustments in the company’s performance outlook will make the stock less attractive for future owners who thus are prepared to pay less for the stock and a result the price goes down. The good news is that when a company performs well its share price generally goes up. This is because more people would like to share in that company’s success. When the sales and profit of the company are expected to increase so does the price people are prepared to pay. Upon the sale of the stock this generates a profit for the original owner. Until the owner sells the stock many stocks pay a dividend which can provide an additional source of income for the owner. Another important benefit of equities is the unlimited upside potential compared to fixed income which, as the name suggests, has a fixed income for the entire term of the bond and a fixed value at maturity, the nominal value. Over time inflation decreases the purchasing power of money. A company can increase their prices and thus sustain profitability and margins, but a bond issued 20 years ago for $1000 will pay back exactly $1000 at maturity. The same amount on paper, but not the same value in real life. There are several widely accepted ways to value equity. What is the right way? There is none as there are too many rapidly changing factors to take into consideration. 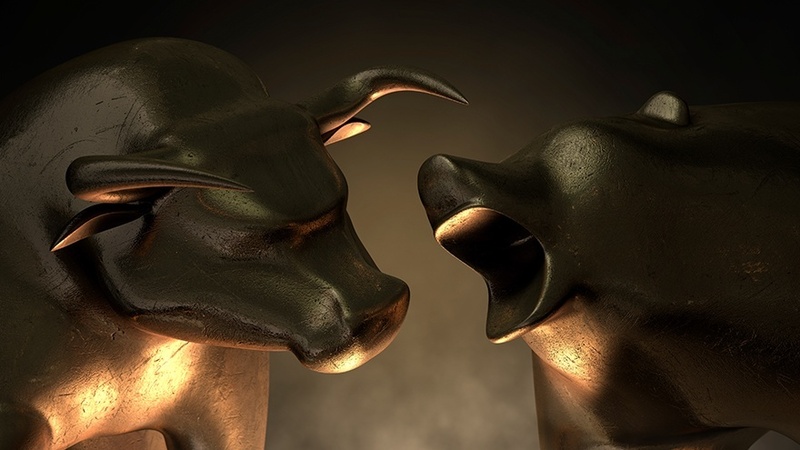 There are however some indicators that can tell us more about the relative performance of the stock. Several valuation methods are available, the applicable model depending on a company’s industry, its characteristics (for example, whether it is a start-up or a mature company), and the analyst’s preference and expertise. One can distinguish between direct valuation and relative valuation models. As their name indicates, direct valuation methods provide a direct estimate of a company’s fundamental value. In contrast, relative valuation methods do not provide a direct estimate of a company’s fundamental value. They do not indicate whether a company is fairly priced; they indicate only whether it is fairly priced relative to some benchmark or peer group. The relative valuation methods rely on the use of multiples. A multiple is a ratio between two financial variables. The most popular price multiples are earnings multiples. The price-to-earnings (P/E) ratio, which is equal to a company’s market price per share divided by its earnings per share (EPS), is the most widely used earnings multiple. DCF models are based on one of the most fundamental principles of corporate finance: The value of a company today is equal to the present value of the future (but uncertain) cash flows to be generated by the company’s operations, discounted by a rate that reflects the riskiness (or uncertainty) of those cash flows. The intrinsic value of a stock? A stock is capable of holding intrinsic value, regardless of what its perceived market price is, and the intrinsic value is often an important aspect value investors consider when picking a company to invest in. During a market selloff, generally all companies suffer, regardless of the intrinsic value of the company. However, once the market selloff is over those companies whose market value is close to or below their intrinsic value often offer great opportunity for investment as their true value will soon be recognized again. “The newer approach to security analysis attempts to value a common stock independently of its market price. If the value found is substantially above or below the current price, the analyst concludes that the issue should be bought or disposed of. This independent value has a variety of names, the most familiar of which is “intrinsic value””. So now that we know what equities are, how it can be valued and what the benefits and disadvantages are what place should equity take up in our portfolios? 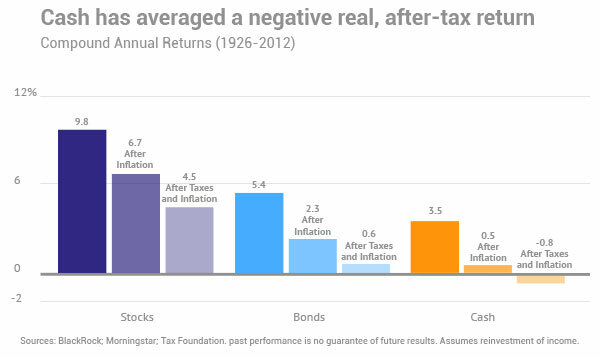 It is easy to see that over the long term equities outperform both cash and bonds especially when one takes into consideration the effect of inflation and taxes. Currently interest rates and bond yields are lower than never before in history. This makes the case to invest in equities only stronger. To achieve the best possible returns over the long-term a portfolio should consist of 100% equities. By long term we mean any period from 5 years onwards. The only time when fixed interest or cash-equivalent assets should be taken up in a portfolio is when the assets will be needed in the next two to five years. Until then there is no reason to hold anything but equities and the short-term fluctuations that are inevitable when investing in equities should be ignored.